It’s been quite a year for Twitter. Out of the most recognizable companies on the Internet, it has arguably undergone the most significant transformation over the past 12 months. From ringing the bell of the NYSE, to making its biggest acquisition, revealing user numbers and other previously unknown details, a book about its growing pains and many, many experiments — it’s been quite a ride. 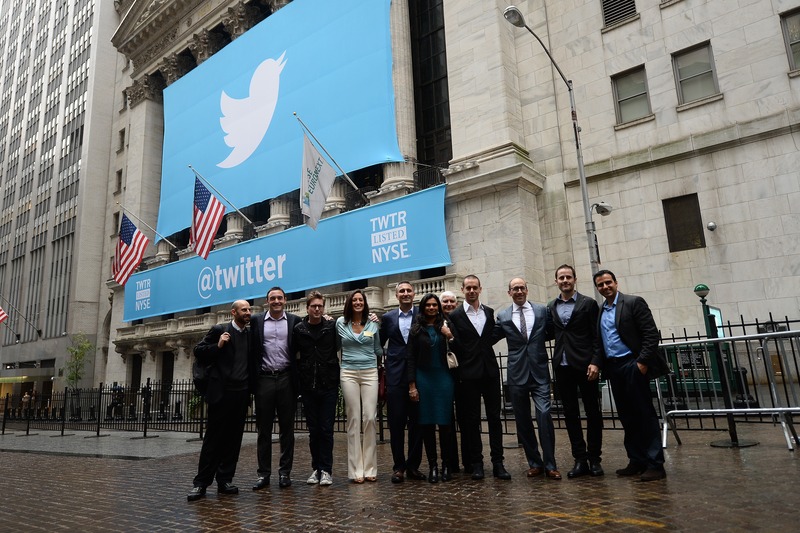 Twitter’s most significant moment of 2013 came on November 7 when it listed on the New York Stock Exchange as TWTR. Twitter’s IPO saw a number of long-serving employees and investors net considerable returns. Co-founder Evan Williams was the single biggest winner with $2.6 billion, chairman Jack Dorsey got $1.06 billion, Union Square Ventures netted the most out of its investors to the tune of $1.3 billion. The public listing meant Twitter was forced to reveal a range of figures that it had not disclosed before, including revenue, user numbers, business concerns, services it sees as threats and more. Most importantly, however, now that it has shareholders it will need to adapt to the demands of Wall Street — that means raising its active user numbers, building out its revenue in international markets, developing its offering against Facebook and proving that its service isn’t as complicated as many non-users think. Twitter came under pressure for having no female representation on its board when it announced its IPO plans, but it finally answered that question when it recruited Marjorie Scardino — the former CEO of publishing firm Pearson — in early December. Scardino’s arrival aside, there have been plenty of other shuffles of significance. @twitter Thank you. There couldn’t be a more exciting time in Twitter’s history to join! The most notable change saw long-serving and much-respected head of platform Ryan Sarver depart in May. Sarver, who headed up Twitter’s relations with the developer community, wound up in the VC world as a partner at Redpoint Ventures. This year, Twitter made a lot of ground towards its vision to become the global town square. It upped its focus on media, events and particularly live TV, areas where it believes it can direct conversation and be a key platform for advertisers, broadcasters and content companies. That promise was made pretty clear during Super Bowl XLVII, when Oreo and other advertisers took advantage of a power cut and generated attention with some slick marketing and brand building. 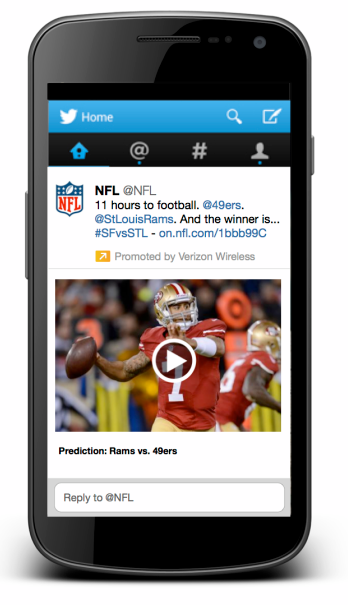 Twitter spent much of the year expanding the availability of its ad products to more markets while adding more options, including a new API to provide more control and TV conversation targeting for advertisers. Facebook may be the world’s largest social network, but Twitter sees itself as a superior place for real-time conversations, and it has remodeled its business (and revenues) around catering to that area — and arguably imitating Facebook in many areas. Aside from changing the wording used to explain its service to users, it struck deals with media companies — such as Bloomberg, Major League Baseball, Time, VEVO and Warner Music — which included a significant tie-in with the NFL to bring video highlights directly to PCs and mobile devices. It also partnered with Nielsen to launch its own TV ratings service in the US. Importantly for Twitter, the first reports providing some credence to its TV claims emerged this year, albeit with caveats. A study from Nielsen, the aforementioned Twitter partner, found that tweets could cause a “significant increase” in viewership, 29 percent of the time. That’s hardly a smoking gun, but it does show that — with more features and stronger network support — Twitter is moving forward. This year has been a year of experimentation for Twitter. The company has continually pointed media like TNW to its ‘Experiments @ Twitter’ blog post when asked for comment or explanation of new pilots and service tweaks. The company’s most significant product changes were two new services that compliment Twitter, and both saw differing levels of success. 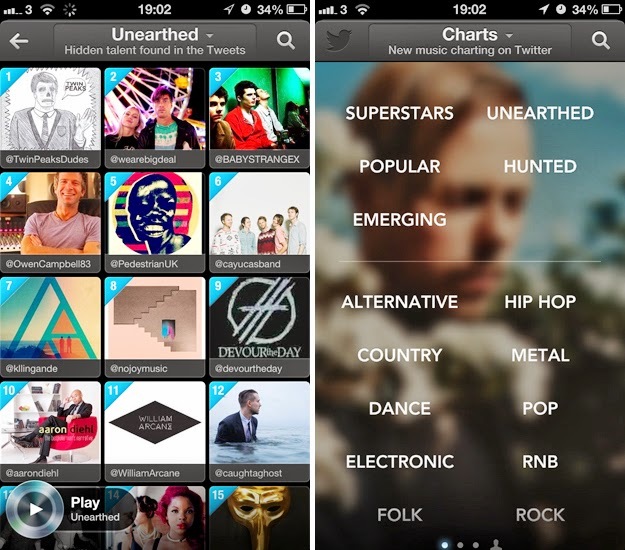 Twitter Music, a service designed to help surface music from tweets, arrived after Twitter acquired a music startup. Despite much anticipation, its iOS app flopped, there is still no Android version, and it has been suggested that Twitter is considering killing off the iOS incarnation altogether. It has been a difficult start, but the service looks to have found a groove of sorts, thanks to apps for Spotify and Rdio which serve as an alternative channel for discovery — though Twitter’s expectation was doubtless more lofty than merely catering to music services. The company also narrowed its focus on mobile, as it killed off TweetDeck for iPhone and Android. This is part of a strategy to focus on the primary main Twitter apps on mobile, and position the Web client as the default for TweetDeck. While the Windows and Mac versions still live, Twitter says new features will land on the Web client first. That focus on narrowing options for users aligns with its goal of controlling more of the user experience, which is central to offering advertisers (that use its Promoted Tweets) a strong vehicle for reaching its users with messages and media. This year was also the year that blogging platform Posterous, which Twitter acquired in 2012, had its uncertain fate finally sealed after it was shut down at the end of April. There has been much talk about the growth of messaging apps and — while there is clearly a business case for a standalone DM app — Twitter has so far not taken the likes of Snapchat and WhatsApp on directly. However, that may yet be realized, since the company added support for photo messages to Direct Messaging, and made the service a central focus in its mobile apps once again — keep an eye on this in 2014. 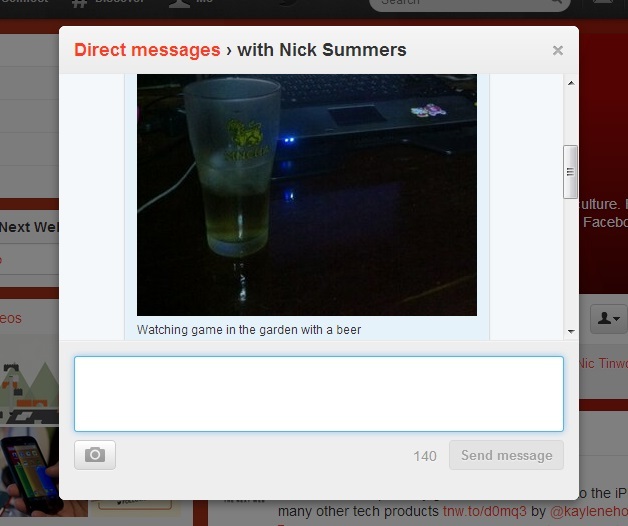 Direct Messaging has been a part of Twitter’s tests this year. The company, in October, quietly added a setting that let users opt in to receive Direct Messages from anyone who followed them, although it subsequently reversed that option just a month later. The company also began testing new discoverability features as DM services: one breaking news and another for sharing popular tweets that your followers are retweeting and users they are following. The latter service was adopted by Twitter’s mobile clients following a successful trial — which is more than can be said for Twitter’s efforts to institute a new system for blocking users. In December, the company reversed a move to essentially change blocking to muting within hours of hitting the switch, citing users’ displeasure with the change. Though it backfired, the quick reversal does at least show that Twitter values the opinions of its users above anything else. Finally, there was plenty of symbolism behind the killing off of Twitter’s iconic fail whale (#RIP). Confirming the news, Christopher Fry, senior vice president of engineering at Twitter, pointed out that things have changed and the whale “did represent a time when I don’t think we lived up to what the world needed Twitter to be”. Twitter picked up a range of companies in its IPO year. The key acquisition was MoPub, the world’s largest mobile advertising exchange. Twitter is said to have paid as much as $350 million to buy the company, which has built up a $100 million revenue run rate which will help Twitter add to its own income streams and spread its footprint to other mobile apps and services. The capture of We Are Hunted was also notable, although not for anything like the size of the MoPub purchase — the startup provided the technology to develop and launch the aforementioned Twitter Music service. Other deals included Bluefin Labs, which Twitter acquired to develop its TV analytics and advertising business, crash reporting service Crashlytics, big data analysis firm Lucky Sort, social discovery startup Spindle, social analytics company Trendrr, and open sourcing training company Marakana. 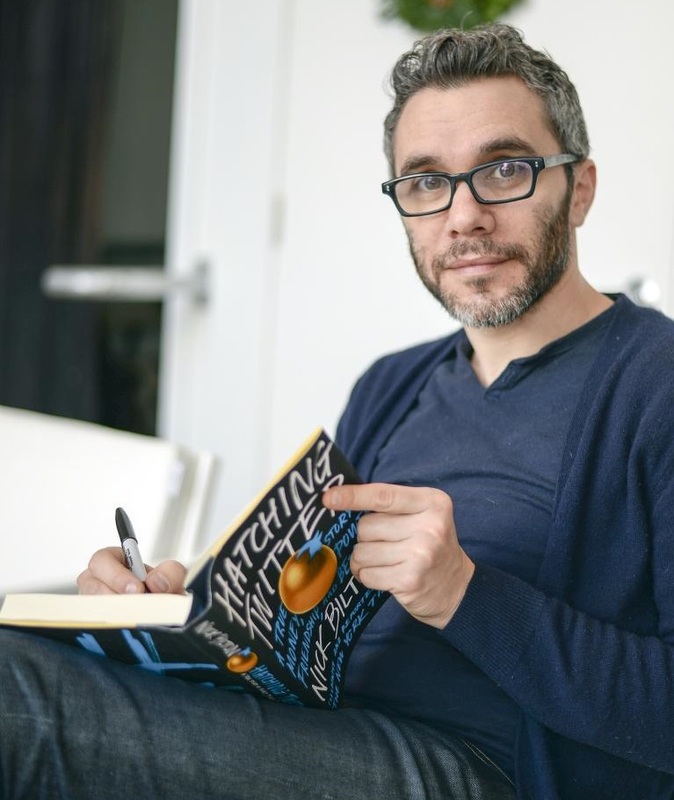 Twitter has come a long way since being founded in 2006, and its story was told through the eyes of New York Times reporter Nick Bilton when he released his book ‘Hatching Twitter’ in November. Bilton met and spoke with many folks involved in and around Twitter, from its early times to the current day, which makes the book the best account of its growth to date. Juicy excerpts from the Hatching Twitter include details of how Jack Dorsey was forced out of the company he helped start (only to be wooed by Mark Zuckerberg), the story of ‘forgotten’ founder Noah Glass, and other tales of personalities clashing as the company tried to find a viable model to monetize its popular service. Much of the narrative is focused on conflict, personality clashes, and other details that don’t leave the figures central to the story coming off smelling of roses — no wonder Jack Dorsey, for one, told his side of things to the media. Lionsgate has optioned the book for a TV series, so we can expect the drama to be played out on a TV screen near you soon. We’ll have a more extensive look at what to expect from Twitter in 2014, but it’s fair to say that the company will continue progress down the same avenues that it did this year. We can expect more trials focused on making its service media friendly and TV-centric, more emphasis on mobile, strategic acquisitions and perhaps the influence of messaging.